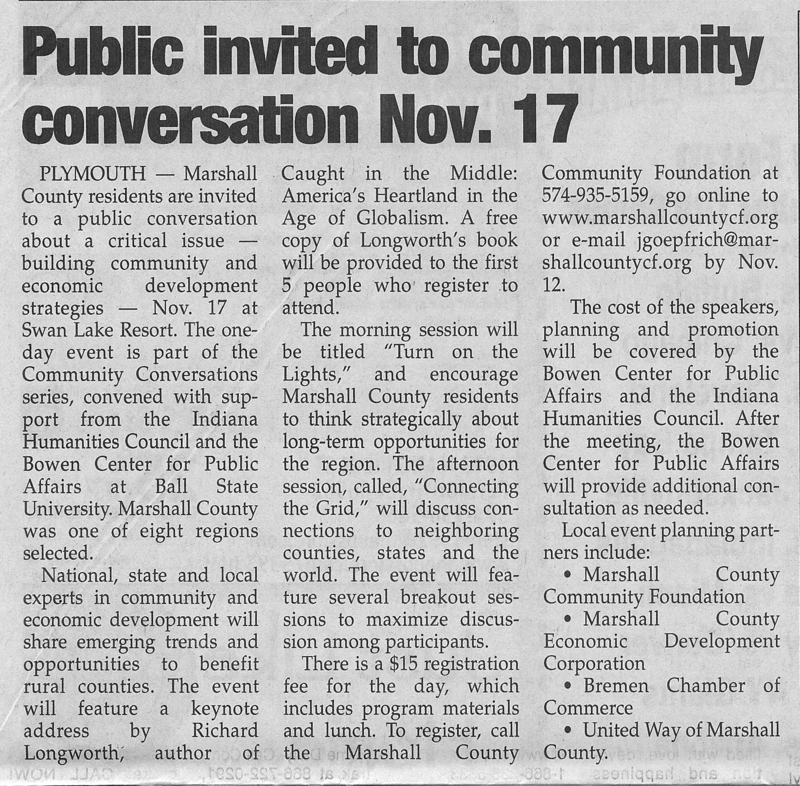 Marshall County Economic Development Corp. (MCEDC) is co-sponsoring the Marshall County Community Conversation this Wednesday. If you haven’t yet RSVP’d, I believe they will still take your reservation. 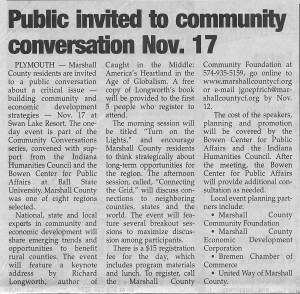 Please consider attending as this is an important meeting to determine the direction of Marshall County. There is a key-note speaker and there will be panel discussion and break-out sessions. This should be an educational experience for attendees as well as the co-sponsors. Make your voice heard! I continue to represent Culver on the Marshall County Economic Development Board. If you are unable to attend, but have concerns or questions, please feel free to contact me and I will make sure your issues are considered. Veterans Day (or Armistice Day or Remembrance Day if you prefer) is observed each November 11th in remembrance of the signing of the Armistice at the conclusion of World War I. The formal signing occurred at the 11th hour of the 11th day of the 11th month of 1918. While Armistice Day was celebrated for the first time the following year, 1919, it didn’t become an official U.S. Federal Holiday until 1926. In 1954 it was formally changed to commemorate all veterans rather than just those who served in World War I. May those who served that have passed before this day rest in peace and all those that are still with us that serve or have served enjoy the honor, admiration and respect they deserve from all of us. 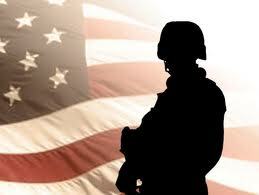 To all veterans… Thank You. The 10th Amendment to the Constitution of the United States of America: The powers not delegated to the United States by the Constitution, nor prohibited by it to the States, are reserved to the States respectively, or to the people. —ABC Chief Economist Anirban Basu. 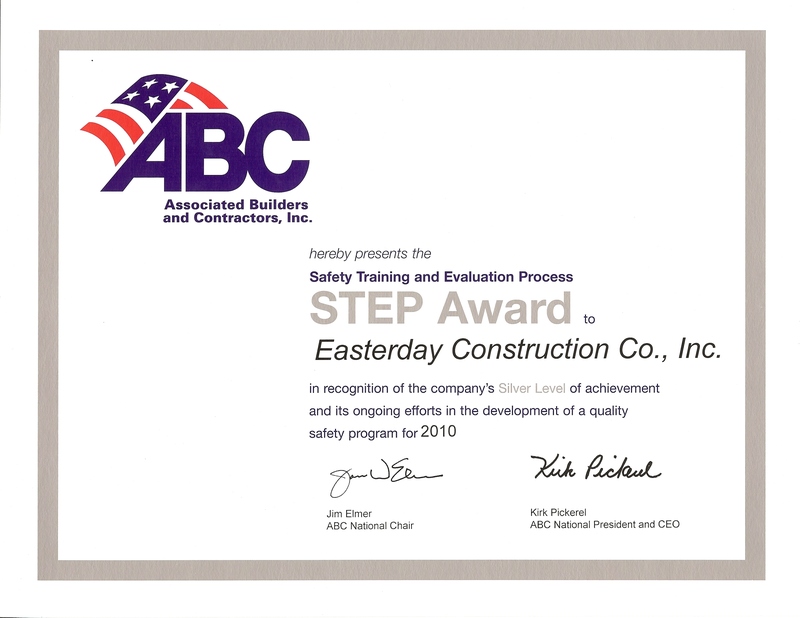 Easterday Construction Co., Inc. received a Silver Level STEP (Safety Training and Evaluation Process) achievement award from Associated Builders and Contractors, Inc. (ABC) for our ongoing efforts to advance our safety program. Thanks to our Safety Officer, Will Pearson, for both administering our safety program and for completing the award application. Thanks to our superintendents and entire crew for realizing the value of safety to our company and every individual employee of Easterday Construction.